Conn Creek Winery is located at the junction of Silverado Trail and Conn Creek road. 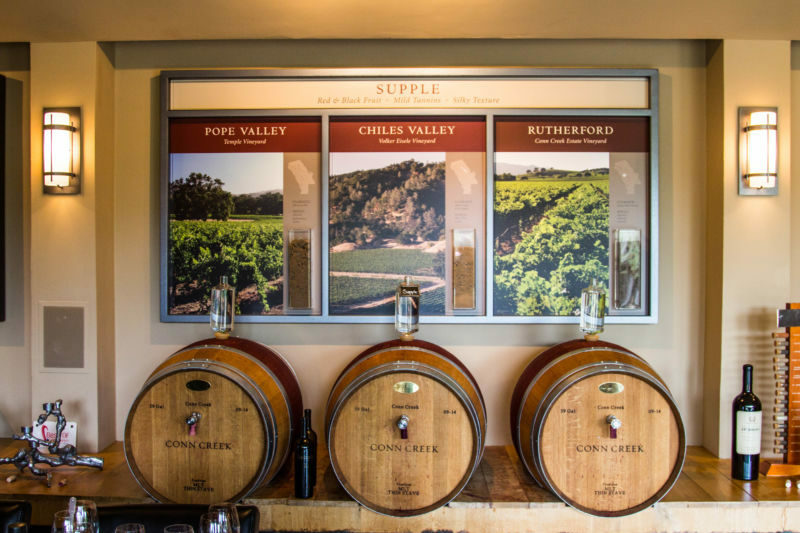 The winery specializes in Cabernet Sauvignon wines from several Napa AVAs, which highlight how much impact the different soils and climates in Napa Valley have on the wine. 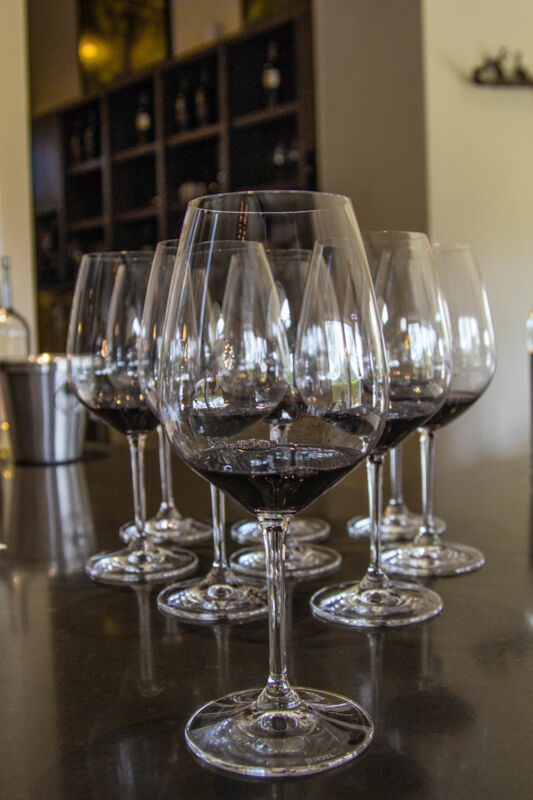 They also have a signature blend, called Anthology, which is a mix of Cabernet Sauvignon from several vineyards and small amounts of other classic Bordeaux varietals. 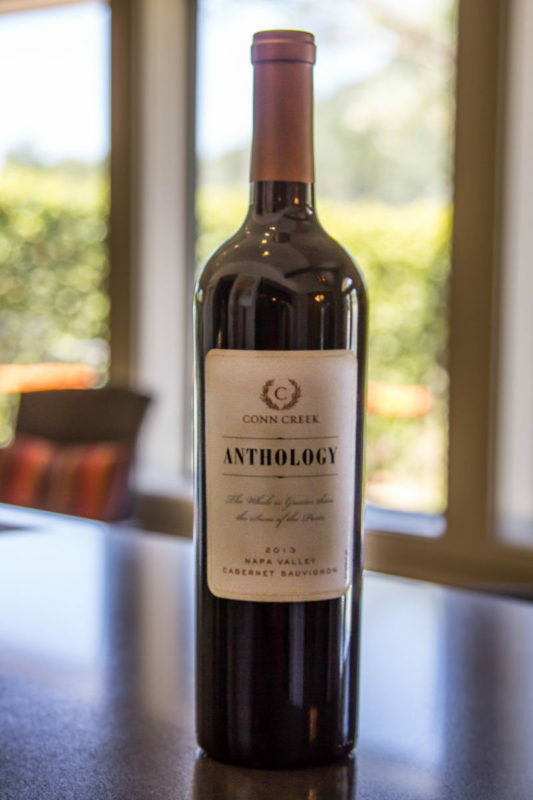 Conn Creek offers customers an opportunity to create their own version of Anthology at their Wine Blending Experience. On a recent Saturday morning California Girl, eight friends, and me attended one of these experiences. This is the third time that this group has participated. Regular readers may recall a recent post on the blind-tasting we performed from last year’s blending. 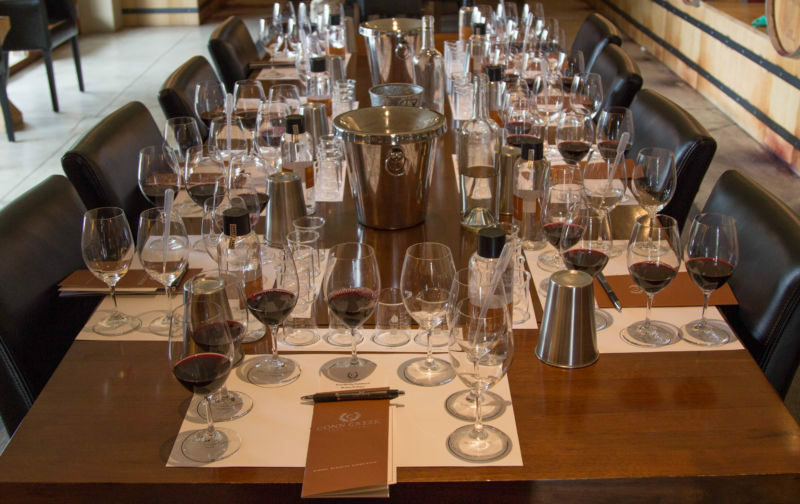 The Blending Experience takes place in a private room alongside their main tasting room. 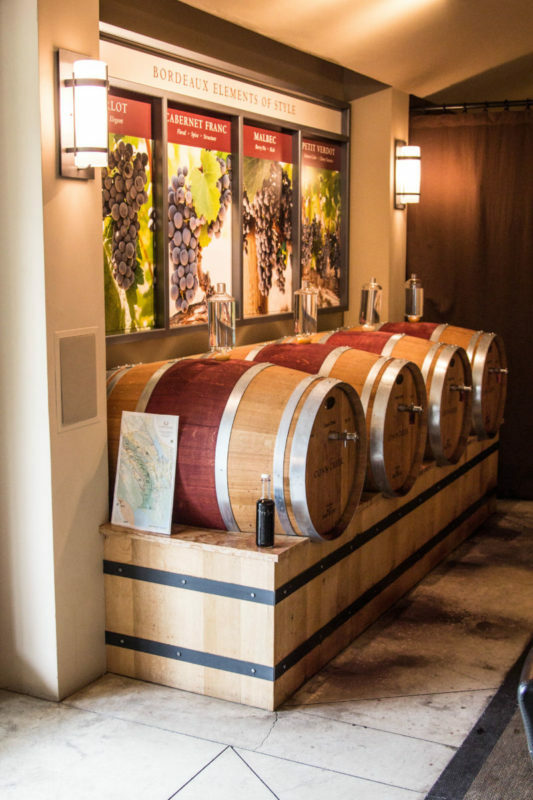 One wall is lined with fifteen fifty-nine gallon casks of 2014 Cabernet Sauvignon. The barrels are medium-light toasted French oak. They are split into five groups. Each group has a general descriptor that applies to the three barrels in that group: Soft, Supple, Complex, Rich, and Bold. In the corner against the opposite wall are barrels containing varietals traditionally used in Bordeaux for blending: Merlot, Cabernet Franc, Malbec, and Petit Verdot. Along the centre of the room are two long tables. Our group took up all of one of these tables and another group were at the second one. There were seven wine glasses at each position. Five of these glasses had wine in them, one from each of the Cabernet Sauvignon groups. Two were empty, to be used for experimenting with blends. There were also four glass beakers which had 20ml of the mixing wines. On this occasion the five Cabernet Sauvignon selected for us were: Hozhoni from Rutherford, Volker Eisele from Chiles Valley, Regusci from Stags Leap District, Saffron Vineyard from Mount Veder, and Diamond Mountain. Our host described each wine in turn and gave us a chance to taste and make notes in the provided booklet. I felt that this section was a little rushed, as I love to take my time enjoying the nose and focusing on the different elements of the smell. After sampling each of the five Cabs, we had an opportunity to taste the four blending grapes. California Girl Comments: I have to admit, I wasn’t paying much attention to our host as he spoke. I had laser focus on the wine, smelling it constantly for its character and what I thought the winning blend should have. I got through the instructions and then went into my own wine blending world. I have to WIN! The next step was to use the provided pipette. For those for whom Chemistry lessons may be a distant memory, a pipette is a narrow tube with a air-filled bulb at the top. Placing the end of the tube in a liquid and squeezing the bulb causes a partial vacuum that pulls the liquid into the tube. You remove the pipette from the liquid, hold over the container into which you wish to move the liquid, release the pressure on the bulb and the tube empties. We were instructed to take six pipettes of any mix of the Cabernet Sauvignon we wished into one of the empty glasses. This created the base blend for our wine. We could try a different blend in the second empty glass. My initial blend, with which I was fairly happy was three parts bold, two parts rich, and one part complex. This part of the experience is illuminating. If you add sugar to coffee, you get sweet coffee. Blending these wines together is not simply additive; you get a taste that is more complex than the sum of the parts. 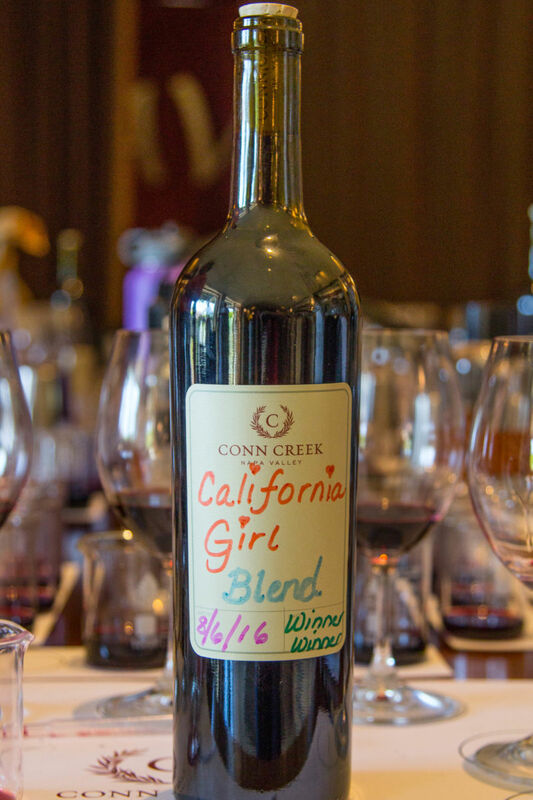 California Girl Comments: For me, half of the joy of blending the wine is smelling it. I made sure I spent a lot of time smelling each wine before adding it into my blend. When I would get a good smell, then I would taste the wine to see what else it needed. Not very scientific of me, but a wine that starts off smelling good has more of a chance of tasting good in my experience. The second step was to add two pipettes of the mixing grapes. This was where I struggled and had to make several passes; requiring me to ask for another glass of the bold Cab. In the end, I turned into a rebel and instead of going with six pipettes of Cabernet Sauvignon, I added a seventh and used just a single dose of a blending grape to round out the blend. My final blend was three parts bold, two parts rich, one part complex, one part supple, and one part Malbec. Adding the Malbec was a strange choice, as of the four blending wines, it was the one that I liked least when tasted individually. However, added to my mix of Cabernet it resulted in a wine that to my palate was better balanced between fruit and dryness. The third step is to take a one litre beaker and scale your blend up to 800ml. Each pipette you measured now represents 100ml in your final blend. I went to the barrels and measured out the correct quantities of the wine. With the aid of a funnel, I then poured my blend into the bottle. It is important to note that a wine bottle does not hold 800ml, as its capacity is 750ml. It is not a good idea to pour until the flask is empty as that will result in wine spilling. This is not just theoretical advice, but is a suggestion based on experience. The final step is to push a cork into the bottle and create a label for your wine. I named my wine Diamond Saffron by The Brit; reflecting that over half of my blend came from Diamond Mountain and Saffron Vineyards with an added flourish of pretension. 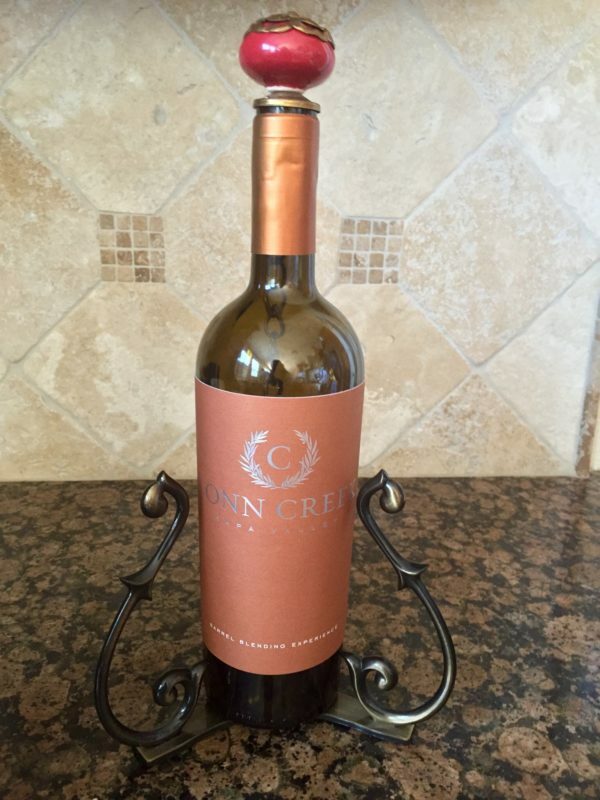 California Girl Comments: It was interesting to watch all of our friends blend their wine and proudly bottle it. There were a few who rushed through the process and were done very quickly. There were others like me who were very focused on their wine and were very precise about what they were making. There are people in our group as they have extremely fine pallets and give me a run for my money. I think this year will be really tough. Still, I am quietly confident. 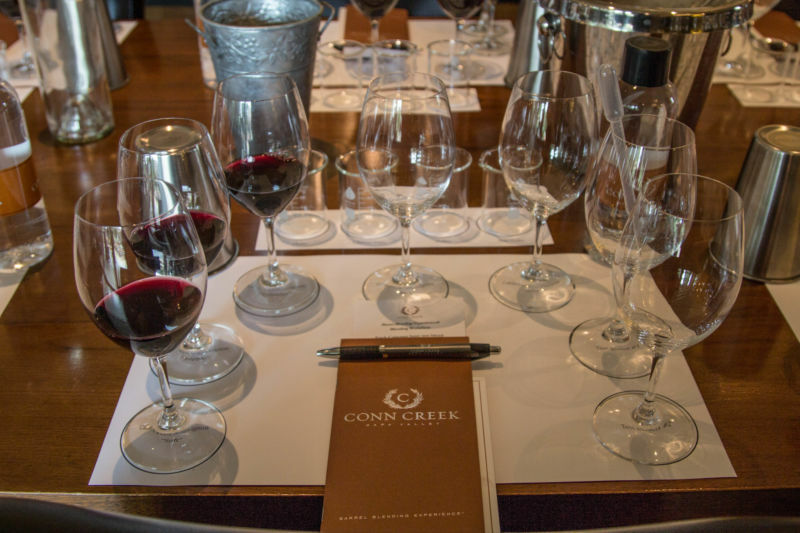 Our wines will now sit in the bottle for about a year before we get together and have a blind tasting and decide the winner of the 2016 Conn Creek Blending experience. As previously mentioned, there was some of each blend left over. This allowed me to taste California Girl’s blend. Based on that taste, I think the highest my wine can place is second.